The southern magnolia (Magnolia grandiflora) is a stately flowering tree that’s native to North America. Southern magnolia trees have many uses and are commonly grown in landscapes throughout regions with mild winters, such as USDA Hardiness Zones 7 through 10, where winter temperatures rarely dip down to 5 degrees F. The southern magnolia is also the official state tree of Mississippi. Southern magnolias are one of the most popular ornamental landscape trees in climates with mild winters. The tree has large, evergreen leaves that are 5 to 8 inches long and roughly oblong in shape. The leaves are shiny dark-green and thick with rust-colored, hairy undersides. The southern magnolia also blooms in intervals during late spring and through summer in large, 8-inch-wide, fragrant flowers that have creamy-white petals and bright-purple stamens in the center. The tree grows in a symmetrical, conical shape that requires little to no pruning. Plant several southern magnolias in a row to create a tall privacy screen or hedge. The large evergreen leaves provide year-round privacy. The southern magnolia tree reaches about 60 to 90 feet in height with a 30- to 40-foot spread. If you plant the trees side by side to form a screen, the magnolias will keep a smaller size. Plant southern magnolia trees in a spot with full to partial sunlight exposure and fertile, moist, well-draining soil. Southern magnolias produce aggregate fruits that have hairy and tan-to-dull, orange-red follicles. The follicles bear bright red seeds in early autumn. Many different types of birds and small mammals, including squirrels, opossums, turkeys and quail, eat the southern magnolia’s seeds, both during the short time that the seeds are still attached to the fruits and after they drop to the ground. 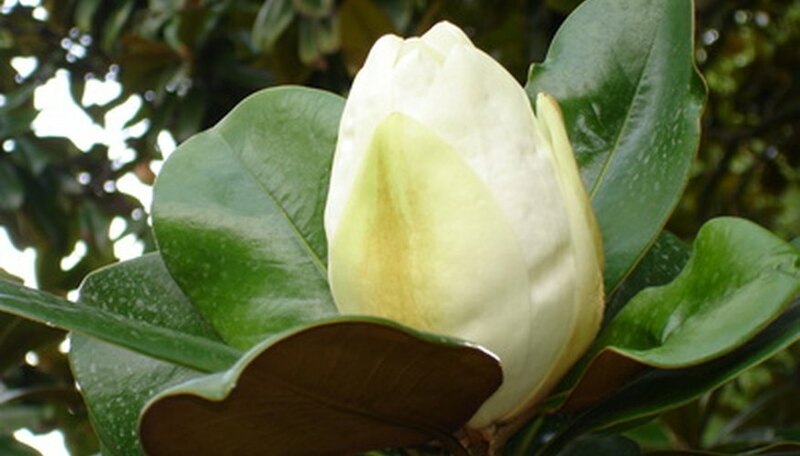 The southern magnolia’s wood is cream-colored, hard and moderately heavy, and is often used to make furniture, cabinets, doors, boxes and other woodworking items. The southern magnolia’s dried leaves are also used by many florists in creating floral arrangements, due to their thickness and large size.